For close to 17 years my Rosemary and I have been receiving a daily New York Times. I believe that it has contributed to making my knowledge of the world of literature, science, politics, history, psychology, dance, theatre, food, and film greater or at the very least better than it was. I also believe that I have obtained an intense history of art on the fly. The paper has stuff on the visual arts (painting, photography, sculpture) almost every day but particularly on Fridays the arts coverage has two separate exclusive sections. The one on the visual arts has added to my knowledge of painters that I knew like Goya and Velázquez but it has also helped me appreciate American artists like Homer, Eakins, Sargent and Hopper. But there is more via ads on Mondays by M.S. Rau Antiques in New Orleans. Recently they had an ad for a splendid pair of Crimean War British canon. This Monday's Kathy by John Kacere riveted my eyes. I now look forward every week to more from the New Orleans gallery. 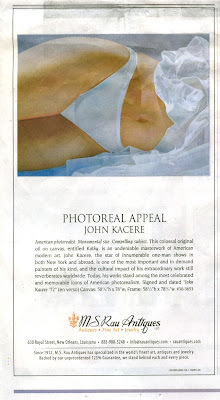 The ad for this last week intrigued me and led me to check out an artist I had never heard of, John Kacere. Perhaps since I don’t have a formal art education this is why that is the case. The fact is that Kacere’s bio and his output is strange but attractive to my eyes. In all my photography of the female body I tended to avoid underwear (I don’t do lingerie). I think that Kacere at the very least (he obsessively did these female torsos for at least 10 years) makes me feel that I may not be as unhinged as some people think I am with my penchant and love for the photography of the undraped female.